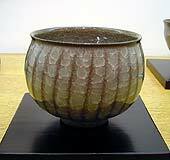 The Beauty of Perfectly Clear "Crackles"
Double and triple crackle layers, kannyu, appear on the glazed surface of the work. I have no words to describe this wonderful and mighty work created by nature. It's like seeing a group of glaciers that move slowly through the northern sea. None of them have the same shape and every pattern is complicated.  The color and thickness cannot be easily examined at all. Everlasting beauty is created by incomputable tension. Kannyu that runs on the surface of yakimono might share the same kind of beauty. 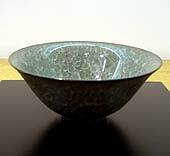 The theme of this exhibition was the clearness of Minegishi's glaze. I was also deeply impressed with the fact that Minegishi Seiko is truly a scholar. 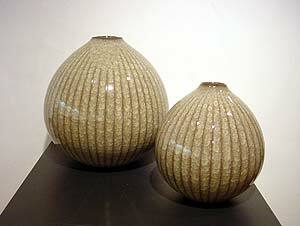 He endlessly experiments with glazes, clay, and firing. The color and depth of his kannyu, which is the crown of his labors, are so beautiful that the more I look at them, the more I feel like I'm being pulled in. 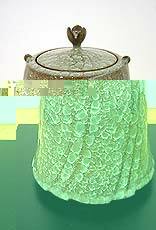 Q. I see brownish works and greenish works. First, I would like to talk about the brownish works, Beishoku-ji. Is this color of rice or chaff? A. Yes, it is color of chaff or groats, kind of a yellowish white. I had an image of rice in my mind for some reason. 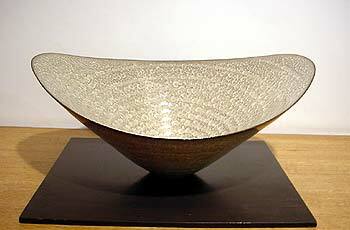 It was 10 years ago that I began making Beishoku-ji, yet it wasn't until five or six years ago that I began creating good pieces. Q. Let's move on to the greenish works, Suisei-ji. You use the Chinese character for jade (hisui) in the name. Q. They are beautiful with many different colors. A. The color of seiji looks different depending on the lighting. 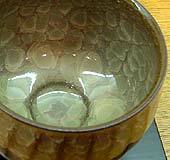 Because the glassy glaze is thick, it absorbs light easily. Yellow, red, blue, and white, there are many different colors of light, and seiji reacts to them very much. Someone said seiji looks most beautiful under the light around 10 o'clock in the morning. I think it looks best under natural light in a dark room facing north. Q. People usually dislike a room facing north. It is funny that that room gets attention here! (Laughs). Anyway, how wonderful these vast array of kannyu are! A. There are small kannyu within long, bigger kannyu called double kannyu. There are many ways to call kannyu depending on the conditions of them: double kannyu, eightfold kannyu, hyoretsu (icy kannyu). It seems like naming is up to a potter by how it looks to him. Q. Kannyu is a mystery. How come they turn out like this? A. It's due to the difference of the shrinkage of the clay and glaze. When I fire clay covered with glaze to over 1200 degrees Celsius in the final firing, the glaze melts and fuses with clay. When the piece cools down it shrinks, for it expanded by the heat during the firing. In terms of the shrinkage percentage, the glaze's is higher than clay's, so the glaze shrinks more. That makes the cracks on the glaze surface. Q. Now, let's use the piece in the photos below as examples. The color and size of kannyu vary greatly in one piece. Q. What about the lines running vertically? A. 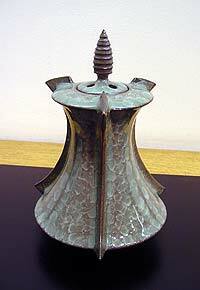 They're called shinogi, which were curved vertically. The curved areas are the real color of clay. This is the technique I often use when I feel like creating variations on the glaze surface. Q. How profound kannyu is! Q. What kind of clay do you use? A. Currently I mix about four different kinds. I am still trying new things. I never stop experimenting. 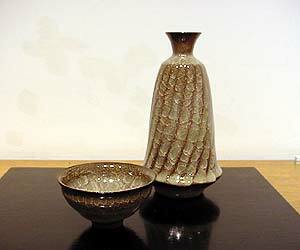 The glaze is always slightly different, and firing is different too. I do all that to make a better piece, even if it's by only a little. Q. What did you intend to express especially in this exhibition? A. Both Beishoku-ji and Suisei-ji have perfectly clear textures. 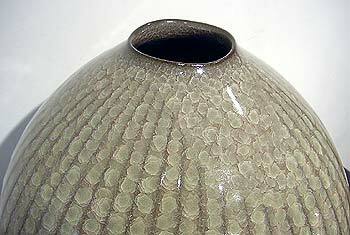 People often say that there is a sense of clearness in the fired glaze. 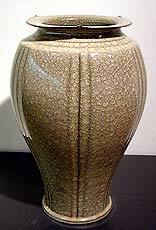 What I want mainly is to create a glaze with a strong impact that looks beautiful. In that respect, the shape of a piece has a substantial meaning. What I have in my mind when I form a piece is what kind of shape will bring the glaze into the best light. I create a piece on the assumption to bring the glaze into play. Q. That's why your shapes have such variety. 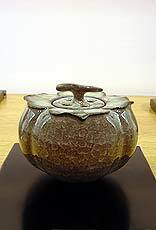 A. I try to show the variety of the glaze colors by curving Shinogi in or making it as futamono (a piece with a lid) rather than just a plain piece. How Interesting Yakimono Is ! Q. You're from Saitama prefecture, aren't you? Q. Is there anyone who is involved with yakimono in your family? A. Not at all. (Laughs) One of my uncles painted. I might have influenced by that. But, I liked making things since I was a child, like making a ship by curving a piece of wood, assembling a plastic model, etc. Q. Did you always get an A in art at school? A. I think I got all A's when I was in middle school. Q. Wow, you're good at everything! Q. I heard you like to play sports too. Q. Then, you were introduced to yakimono. A. Yes. I heard about a place in Obuse, Nagano prefecture where people make ceramics, so I visited there just to hang out. That was fate. The area produces apples. They used apple wood ash as a glaze. The clay they used was from a neighboring town called Nakano. I found it very interesting that one can make ceramics using local materials. I was surprised they turned out such interesting pieces. 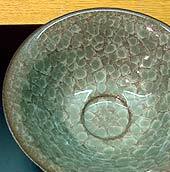 I only had daily-use porcelain that regular families use, so I did not know much about stoneware. So, I decided to give it a try. Q. A turning point in your life! A. So, I was taken under the care of the kiln. The master was an extremely interesting person. He had these sharp eyes that grasp the real meaning of things. Oh, you can rarely find a person like him. Q. Can you tell us about the master? A. Yes. His name is Miyazawa Shiro. 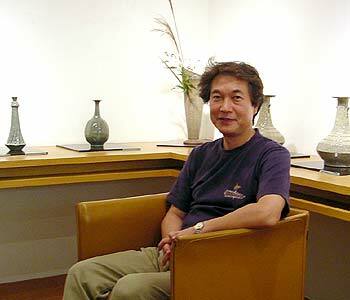 Mr. Miyazawa had literary talent, so he not only made ceramics, but also wrote articles and drew. He had a wonderful eye for objects and also for people. He was also into collecting antiques. In his closet were a lot of Korean Yi-Dynasty pieces. 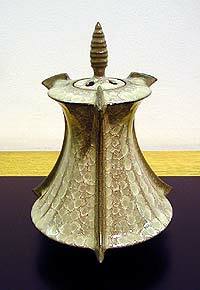 I like Yi-Dynasty pieces because of that. Q. So, you stayed in Obuse for a while? Q. Self-taught! How wonderful! It must have been awfully hard to try and figure it out along the way all alone and to experiment with making ceramics. So, when did you move to Nasu where you have your kiln now? A. Exactly 10 years ago. That was when I began making Beishoku-ji. Nasu is blessed by nature and has good hot springs. (Laughs) It is a very comfortable place to work. Making works keeps me busy lately, so I cannot take much of vacation, though. Q. 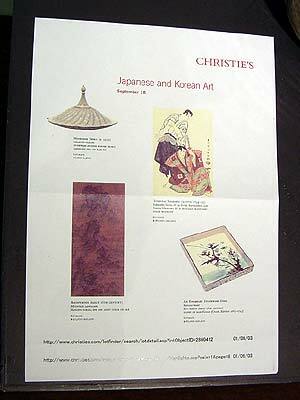 Your Beishoku-ji work was put up at the prestigious auction house Christies. How many times has Christies had your work? A. This time (September 2002) was the third. All of them were in New York. The first time (September 2001), my work was on the flyer with Kenzan and Sharaku! Q. What excellent members they are! Q. Also, your work was acquired by an American museum. A. Yes. A lot of happy things have happened this year. Q. Is there any new theme that you would like to pursue from now on? A. 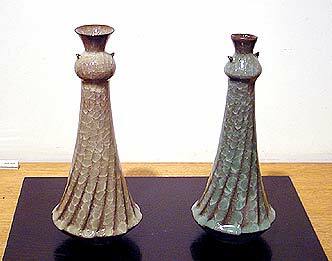 Yes, to create a piece like those from the Southern Song Dynasty. They are known as the greatest of all Chinese seiji. There is not much kannyu in such work. The glaze is amazingly beautiful even on a tiny fragment of a piece. What is in my mind is to make a piece which makes people exhale just by looking at its glaze.